Many homes in New Jersey are built with copper drain pipes or copper sewer lines. Copper has an impressive lifespan of up to 50 years, but unfortunately, this particular metal is prone to extensive corrosion after decades of wear and tear. 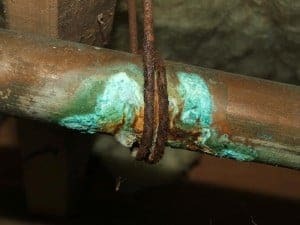 Copper corrosion can lead to water leaks, discolored tap water, clogged drains, and other problems that need sewer repair services, making it a serious concern if you own a home with older plumbing. If you’re having problems with corroded or broken copper sewer pipes and drain pipes, you’ll need an experienced NJ plumber to repair or replace them. At A1 Sewer & Drain, we provide 24-hour sewer repair in NJ and drain repair services for broken and corroded copper sewer and drain lines. Call us any time to find out more, or to get same-day service in under an hour. Cuprosolvency. In some areas, copper ions stay in solution in the tap water, instead of precipitating onto the walls of the pipes. This lowers the pH of water, and can lead to elevated concentrations of lead in the drinking water. 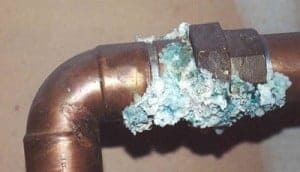 Cuprosolvency can occur when water stagnates in the plumbing system for an extended period of time, and can cause blue-green water discoloration. Leaks. Copper normally forms a protective layer along its surface, guarding against corrosion and preventing leaks from broken drain pipes. However, this protective film can wear away, creating areas of corrosion that can turn into pinhole leaks. Microbe-induced pitting. 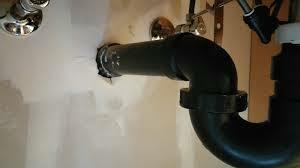 This is most likely to occur in large commercial and industrial plumbing systems. Biofilms grow inside the pipe, composed of thin, continuous layers of bacteria that contain polysaccharides. These biofilms eat away at the copper pipe, causing corrosion and leaks. Concentration cell corrosion. 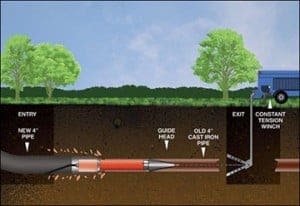 Deposits of minerals like silica and iron oxide (rust) can create an oxygen gradient inside the pipe, with low concentrations under the area with buildup or debris. This can lead to further corrosion. Stress corrosion cracking. 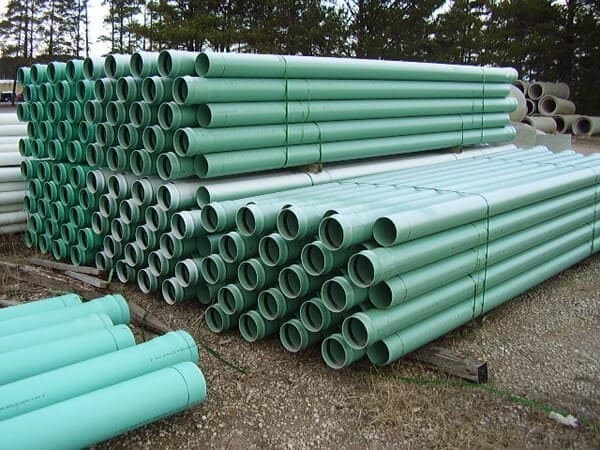 Occasionally, copper drain pipes can crack lengthwise due to residual stress from the manufacturing process, usually in the presence of a moist, alkaline environment and an agent like ammonia. Brass dezincification. Brass is a copper alloy often used in pipe fittings. Over time, the zinc contained in the alloy can wear away, exposing regions of porous and low-strength copper. 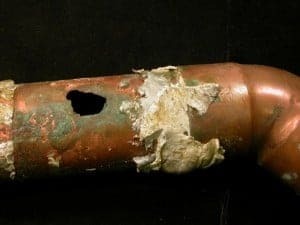 These are just a few of the ways that corrosion in copper and copper alloys can lead to broken drain pipes or broken sewer lines. If you’re dealing with leaks from corroded, broken copper drain pipes or sewer pipes, you’ll need experienced plumbers to fix the problem for you. 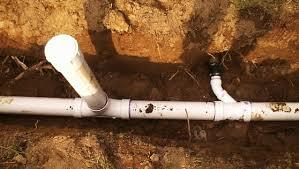 In most cases, drain pipe replacement is the best option for corroded copper drains. 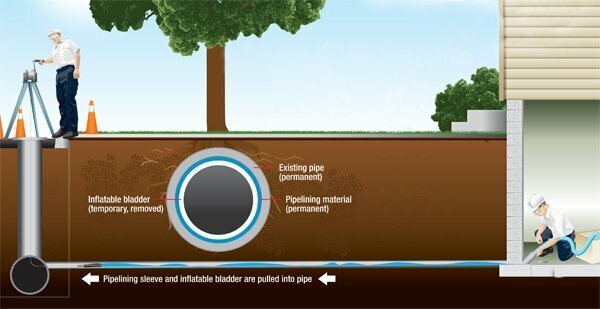 For sewer lines, plumbers may be able to patch holes and leaks with trenchless sewer relining. At A1 Sewer & Drain Service NJ, we offer sewer repair, NJ drain pipe repair, sewer line replacement, and drain replacement for old, broken pipes that have significant corrosion. We’re available 24/7 for fast, reliable emergency service. Call us today for great copper sewer pipe and drain pipe repair in Bergen county, Union County, Essex County, Hudson County, Morris County – Morristown northern NJ, at 201-645-0888.